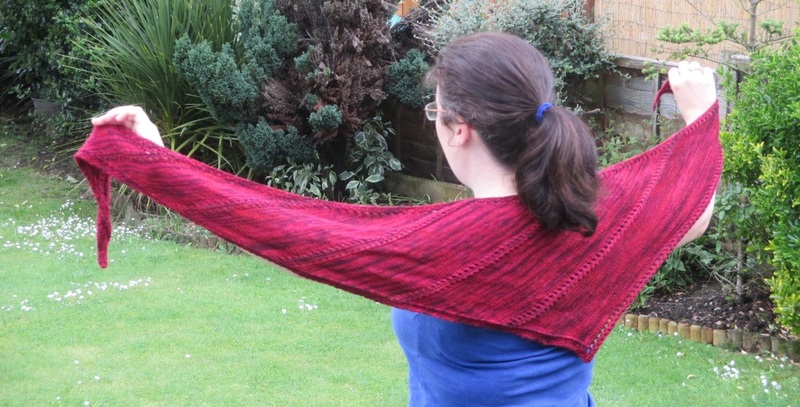 Yarnshine is a shawlette designed to let your yarn shine. Whether you prefer the classic look of a solid-coloured yarn, the subtle colour shifts of a semi-solid or tonal yarn, or the fun of a multi-coloured yarn, Yarnshine lets the yarn speak for itself. The asymmetrical triangle shape can be wrapped like a scarf, worn bandana-style, or wrapped around the shoulders and fastened with a pin. The pattern itself is easy without being boring. Eyelet borders define the stocking stitch segments which grow as the shawlette lengthens to give pleasing dimensions to each segment. The finished shawlette measures 16" deep by 70" long when made to pattern tension of 20 sts and 32 rows over 4" of stocking stitch. Given the natural tendency of stocking stitch to curl, I recommend using a yarn with a good proportion of natural fibre which will hold a block well so that when you block it flat it stays that way! Cancellation and refund rights: UK/EU law requires me to advise you that you have the automatic right to cancel with a full refund within 14 days of purchase unless you have downloaded the pattern. By starting the pattern download within 14 days of purchase you expressly agree to waive your right to cancellation and refund. You can read my full terms and conditions here. All patterns are priced in GBP.